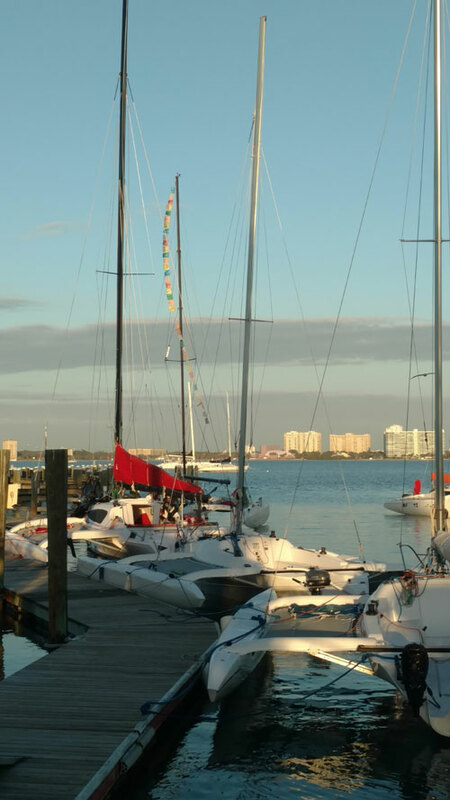 Two Chesapeake Bay racing multihulls traveled 2000-plus miles roundtrip to Sarasota Bay FL, to compete in the 2019 Sarasota Sailing Squadron annual Sarasota Bay Multihull Regatta, held February 22-14. Boats from as far as Ontario, Canada, traveled to make a 25-boat multihull fleet, broken into three classes consisting of PHRF Low, PHRF High, and Sprint 750. Fred Marl’s Reedville, VA, based Truckin’ with a crew of Dave Godwin and Vincent Haynie competed in the Sprint 750 Class and Josh Colwell’s King George, VA, based OrgaZmatron with a crew of Karl Liebert, Joshua Nealy, Dwight Wessel, and augmented with Mike N. competed in the PHRF Low class. With tempertures in the low to mid 80s and in varying conditions including moderate to strong winds on day two, the fleet completed nine races over the three days. While neither Truckin’ nor OrgaZmatron placed high in their classes, fun was had by all. Things happen quickly on multihulls, and there was no lack of action on the racecourse with first-hand observations of: consequences resulting from failure to yield to the right-of-way boat; how not to lose a man overboard at a leeward gate in traffic; what happens when you’re caught overpowered in a multihull and things go wrong quickly; and why it’s important to properly maintain your standing rigging! Day one’s race number one saw a textbook port-starboard tack collision of two F-31s. With multiple hails, the port tacker wouldn’t yield and when that was evident the starboard tacker had insufficient time and distance to duck, thereby colliding with the starboard aft ama of the port boat, going up onto the trampoline but luckily avoiding severe bodily injury or punching the bowsprit through their main or taking out their standing rigging. The collision resulted in substantial damage and a big hole in the aft starboard aama of the port tacker who protested the other boat claiming “finishing rights” or some such nonsense. Unsurprisingly both were scored DSQ, the port tacker for failure to yield, and the starboard boat for failure to avoid a collision. Day two, race two had a man overboard at the leeward port gate in heavy traffic with multiple boats converging on the mark. While his life vest inflated immediately, there was no radio broadcast, resulting in a boat going right over him while he pushed off about six inches from the windward ama which was flying out of the water. Immediately following that, a man overboard was broadcast and the safety boat picked him up uninjured and returned him to his boat. It is still unknown how or why he went over. Day two race number four provided by far had the greatest excitement when a boat got caught in a big puff with spinnaker up, and went over. Given that Sarasota Bay is pretty shallow, the mast came to rest on the sand in approximately 10 feet of water. As we did three more legs it was quite a sight to see on its side, with two hulls up in the air, sails in the water, and the spinnaker flopping around to leeward. We all felt like a bunch of vultures circling to get good pictures. A little more than an hour after the fleet returned to the dock, the boat had been righted and was towed in with rig intact, straight, and was met with a loud round of applause. Many folks pitched in to help clean and rinse, repair the spinnaker, and get the boat back in shape. They went out the next day, completed all races, and maintained their first place standing. Kudos go out to Third Tri 2 for a job well done! In retrospect, it was really a great time, and the weather was very pleasant especially given the fact that 51-plus feet of truck, trailer, and boat had departed VA, in the wee hours of February 20 in the snow with approximately three inches on the ground. 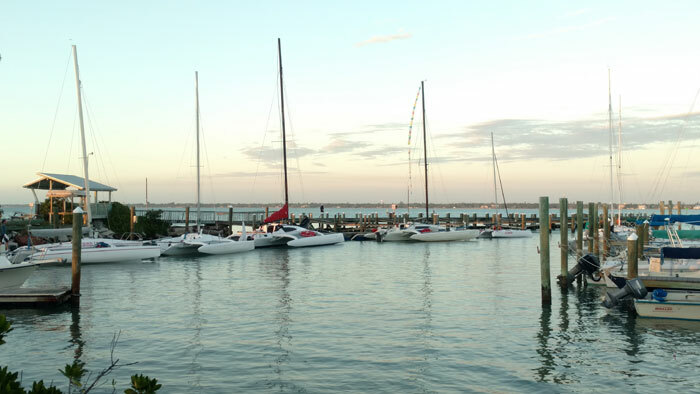 The host club, Sarasota Sailing Squadron, was very accommodating, and the fleet had a wide variety of teams and experience including Olympic Medalist and World Champion Sailor Randy Smythe who won the PHRF Low class and the overall regatta. The racing format was W/L, short one nautical mile legs, two times around, resulting in quick legs with more spinnaker launches and retrievals than the OrgaZmatron crew typically does in two seasons on the Chesapeake. We learned a lot, identified several areas for improvement, made some friends and good contacts, and came away happy to have participated. The 2019 sailing season is upon us, the Chesapeake Multihull Association (CMA) racing schedule has been posted, and it’s time for planning your racing schedule. This year marks the 70th running of the Down the Bay Race (DTB) on May 24 hosted by Hampton Yacht Club and the Storm Trysail Club (STC). Following right on the heels of DTB is Hampton Yacht Club’s 2019 Southern Bay Race Week (SBRW) May 31 to June 2. The registration sites are up for both with multihulls already registered. We’re looking to have a good multihull turnout for both events this year so mark your calendars and register now. In other news, two Chesapeake Bay multihulls will be competing in the 2019 Block Island Race Week (BIRW). Timothy Lyons’ Corsair TP 43 Triple Threat and Josh Colwell’s Corsair F-31R OrgaZmatron will head north racing under the New England Multihull Association banner in the biennial 2019 Storm Trysail Club Block Island Race Week June 23 –28. And lastly, we’re always looking to get more multihulls out on the water and involved with the Chesapeake Bay multihull scene. If you’re a multihull owner and don’t get out much, please consider becoming a CMA member and joining us for on-the-water fun. Check the CMA website for additional multihull news, and if you have any feedback or suggestions on how to improve the Chesapeake multihull experience, feel free to take the survey from the website, and/or email us. We want to hear from you!